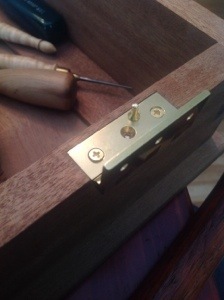 Installing hinges has never been a difficult task as long as they are marked carefully and care is taken to chisel to the gauge lines, corners are cleaned well and the bottom is level. installing the screws is where my problems begin. 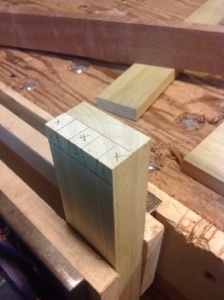 I used an awl to mark the center of the holes. drilled carefully, added soap to ease the screws in and installed 11 of twelve with no problem.However I must have shortchanged the brass gods; therefore the requisite broken screw AAAGGGHHHHHH!. Purchasing drawer knobs and pulls in a store always leaves me with a sense of impending doom. A regular maintenance item around the house seems to be the pull from a cabinet, knob from a drawer or door knob falling off. It isn’t the knob or pull that is at fault but the method that is used to fasten it to the door or drawer. I laugh when my mind pictures the look on my children’s faces as a knob comes off in their hand. It is a look of puzzlement and amazement. Puzzlement because the drawer did not open, and amazement that they have a super human strength that can separate a knob from a drawer. 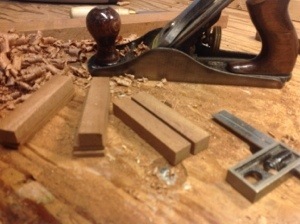 The drawer pull begins with four pieces of wood, carefully milled flat and square. The top and bottom of the pull are made from 3/16″ material . 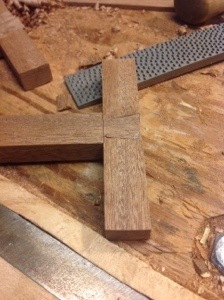 The pieces are curved along the length and the edges rounded over. 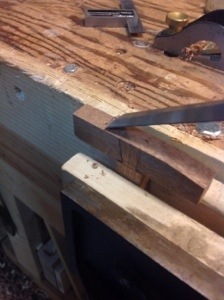 I made the curve using a chisel and #4 plane, smoothing the curve with a rasp. 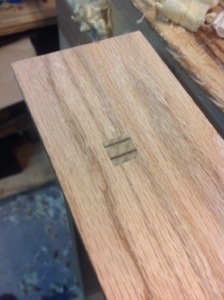 The edges are rounded over with a mill file and the piece is sanded smooth. 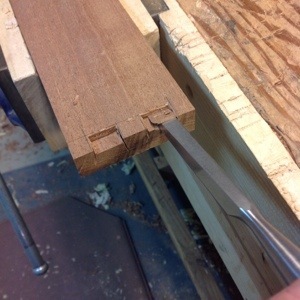 Next I take on of the two pieces of 1q/2″ x 5/8″ and cut the tail of a dovetail, then I cut the tail in half so that I can create a half lap joint in the center of the other piece. Once the pieces are glued together I used a chisel and rasp to cure the piece to match the curve on the other two pieces. 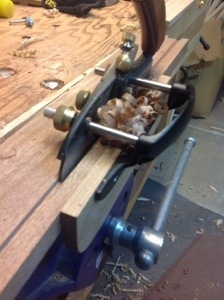 Then I glue all of the pieces together and use my clamp to hold them in place until the glue dries. When the glue is dry a little sanding and the pull is complete. 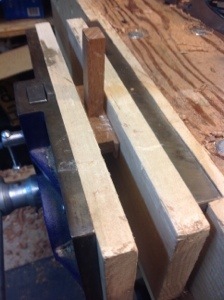 Repeating the process produces a second pull for the other drawer. 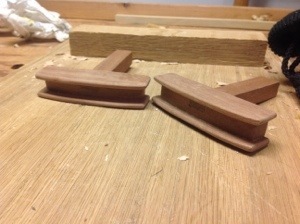 These pulls are made from scraps of Sapele from the chest, but I can see possibilities of using different colors of wood to produce different effects. 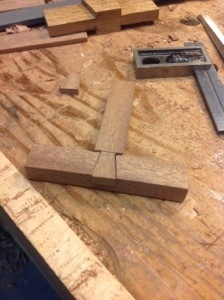 imagine the look a this pull with the center piece made of walnut or blood wood. It’s been a great day and I am very satisfied with the results. Now I have to wait for the hinges, install the pulls and do a little final fit and finish. 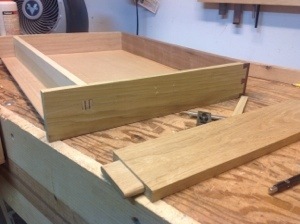 With the pinned housing joints complete, only a couple of steps left to complete the drawer. 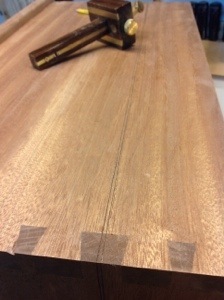 Mahogany plywood was cut to fit into the grooves and slid into place. I carefully drilled holes for 5 screws that will hold it. 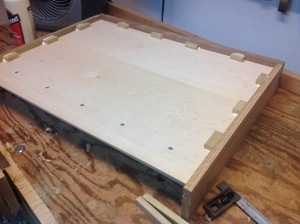 I then cut several 1.5″ pieces of wood and glued them into the edges of the drawer and bottom of the plywood. 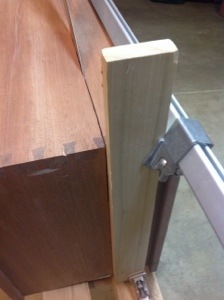 When the glue dries it will tighten the drawer bottom and prevent any banging of the plywood in the groove. You’re saying to yourself – what about expansion…….hopefully with plywood there will be very little. 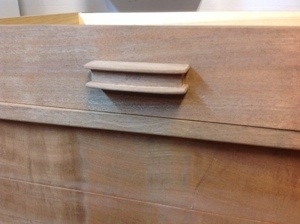 Another design aspect that you may not have picked up, the back of the drawer is 2.5 inches in from the end of the sides. When the drawer is open the back can align with the case without the drawer falling out of its slot. If you are like me, anything buried in the last few inches gets lost anyway. Next? I have to install hinges (in the mail somewhere), make drawer pulls (they’re a great design), and smooth the case….Have a Great Christmas! 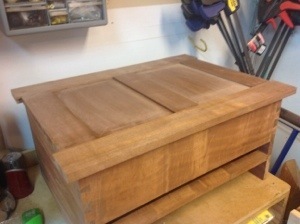 Now that I have the drawer front and sides complete, I need to cut the mortises for the bottom. Nothing special about this process. 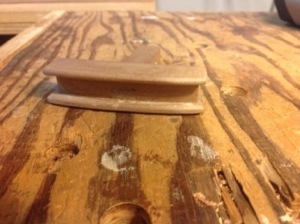 I use my plow plane with a 3/16 blade and cut one in the front and each side. 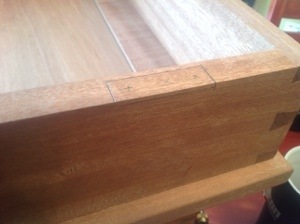 The unique part of these drawers is how the back is mortised and pinned into the sides. 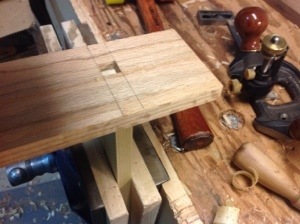 There are several ways to connect the back to the sides, dovetails, mortise and tenons, screws etc. Each of these work in its own way; for this project I was introduced to a method I have not seen before. 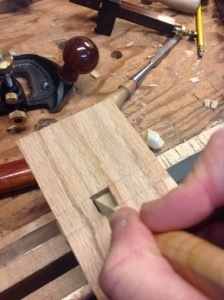 A mortise is cut at the rear of each side and then a through mortise is cut through the side to house a pin. 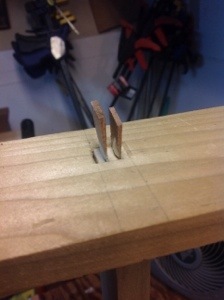 The pin is then held in place with wedges. 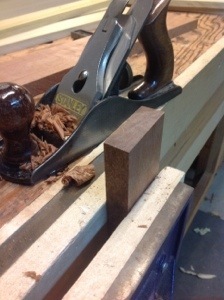 I hope the pictures are self explanatory…This is a great joint, adds character to the drawer and I don’t anticipate any chance of a joint failure in the future. 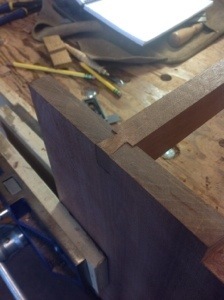 I have a fair amount of confidence in my through dovetails. Generally they come out well and only occasionally do I have to make a repair or repeat a cut. 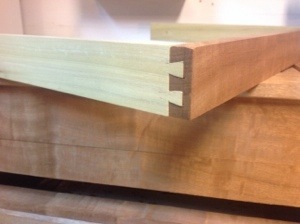 Half Blind dovetails is a different experience. 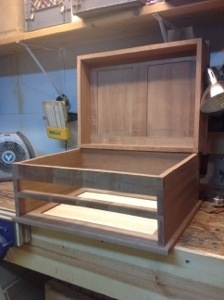 In fact I have no experience at all and when I have made drawers that required a clean face I have made through dovetails and used a face board. 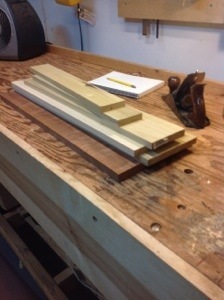 I begin by preparing stock for the two drawers. 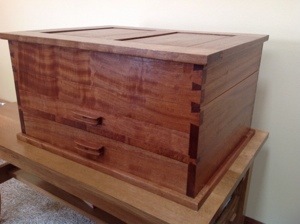 The front of the drawer is obviously Sapele. The sides and back could be Sapele, but I like the look of contrasting woods so I dig through my offcuts and come up with poplar and Oak. 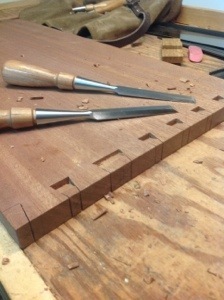 The key to any dovetail is to begin with well prepared stock that has square edges.I carefully plane the sides then take a few minutes to sharpen my blade and smooth the end grain. Two years ago I would have hesitated before planing the ends and left them to the saw cut from a table saw. Now I just sharpen the blade and plane three quarters of the way across from one side, Reverse the board in the vice and finish up the work . 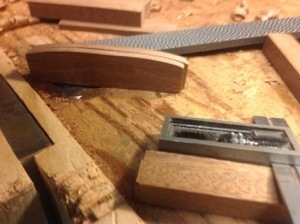 There is something particularly satisfying when smoothing end grain. The blade makes a crisp sound and if all is right the grain comes away like flowers of a petal. 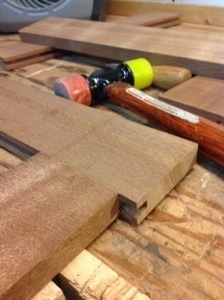 The next task is to lay out the dovetails and sides. Experience tells me that the clearer you mark your work the less chance for a mistaken cut. I always take the time to mark each line and then mark the material to be removed with an X. It guides the cuts, ensures I place the saw on the correct side of the line and reveals what the work should look like when completed. In the picture you can see that I am using a backer board for the cut. 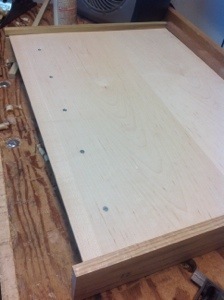 This board will be used to transfer the cut lines from one side of the drawer to another ensuring a perfect match. I saw out the tails for both sides of the first drawer and then pause realizing that I need to resharpen my saw. I’ve been sharpening my own saw’s for the past year and have found it a fairly easy task. I tend to wait too long before resharpening saws however, making the task more difficult than it should be. 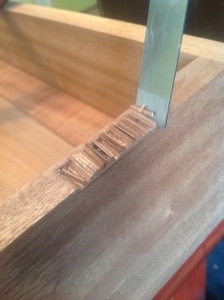 After five minutes I finish off the tails for the second drawer and begin layout of the pins. This is where I am moving into new territory with the half blind pins. how their method is best. 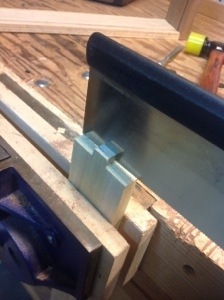 This is the only way I know how to cut half blind dovetails so I have no experience for comparison. It takes me a couple hours to chop out and fit all of the pins and when I am done I am fairly satisfied. My only regret is not using the red oak for all of the sides. It is much prettier and I am more satisfied with the crisp lines that I leave after chopping away the wood. 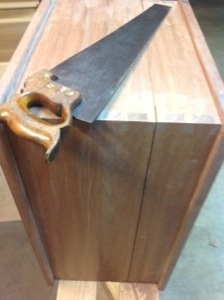 Before I attached the lid of the tool chest I marked the cut line for the lid. I’m now physically prepared to make the cut. Notice I say physically, the chest is positioned, saw is sharp, cut lines marked……mentally however I’m a little concerned. Sawing a straight line all the way around the carcass looks to be a little tricky so I clamp a guide to help me get started. 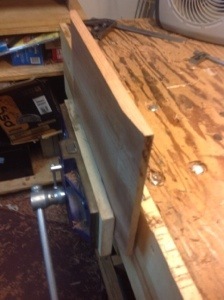 Then using a panel saw I progress one edge at a time around the chest. 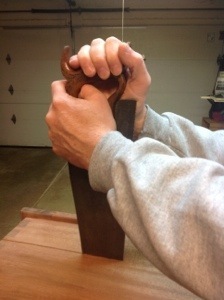 Changing my hand hold on the saw gave me more control as I attempted to stay between the marks. Finally the cut is complete. 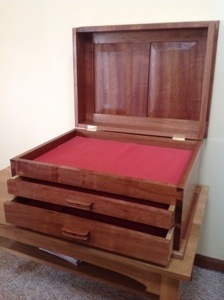 I’ll need to take some time with a plane to clean up the edges, find some hinges, then I can begin the drawers.